Beautifully engraved Certificate from the Razorfish Company . 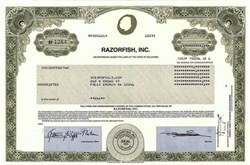 This historic document was printed by the United States Banknote Corporation and has an ornate border around it with a vignette of the famous Razorfish Logo. This This item has the printed signatures of the company's officers. NEW YORK, Aug 14, 2001 - Internet consulting firm Razorfish (RAZF) Inc. on Tuesday posted a second-quarter pro forma loss that just met its already lowered guidance, said it had cut its worldwide staff by half, and warned of further softness. New York-based Razorfish, which has seen demand for its services wane amid the Internet bubble deflation, cut 600 jobs and closed two of its offices during the quarter in a move to trim costs. The company, which had warned of weaker results in late July, posted a second-quarter pro forma loss of $3.7 million, or 4 cents a share, compared with income of $7.3 million, or 8 cents a share, a year earlier. Analysts, on average, were expecting a loss of 5 cents a share for the quarter ended in June, according to a survey by tracking firm Thomson (TOC) Financial/First Call. 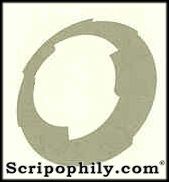 Second-quarter revenues fell to $28.7 million, less than half of the $76.6 million reported in the year-ago period. Despite weak results, in tandem with other industry peers, Razorfish's chief executive, Jean-Philippe Maheu, told analysts during a conference call Tuesday afternoon that the company was looking to become profitable "as soon as possible." As part of its cost reduction plan, Razorfish closed its Helsinki and Milan offices during the second quarter. In the period, it also cut 600 jobs, of which 170 were non-billable staff. As of March 31, the company had some 1,320 employees worldwide, Maheu said. By early August the company's personnel was about 670. Second-quarter severance and other charges related to the restructure were $70 million. During the period, Razorfish said it had gained clients such as Glaxo SmithKline, Solaris Health Network, Canadian Broadcasting Corp., Ikea, Beyerishe Landesbank, CB Richard Ellis, UK Channel Four, and others. Chief Financial Officer John Roberts told analysts that Razorfish's third-quarter results were seen between a loss of 1 cent per share to a profit of 1 cent. Revenues were expected in range of $20 million to $24 million. According to the two analysts polled by Thomson Financial/First Call, Razorfish is seen posting third-quarter losses of between 3 cents and 4 cents per share. Razorfish, one of the last Internet consultancies still in business, closed at 17 cents on September 14, 2001. The company, now trading about 99 percent below its year high.